The 2017-18 Philadelphia Flyers season was a roller-coaster ride that ended with their second postseason berth in the last three years. The season was filled with great moments, goals, saves and player performances. Over the next couple of weeks, The Hockey Writers will take a deep look at each month of action. We will break down what happened in a specific month and what it meant to the season and the future of the franchise. The first day of the month, the Flyers faced off against their division rival, New Jersey Devils. Coming off two-straight losses, this game started well for the Flyers as they held a 3-2 lead into the second intermission. Alex Lyon, making his first NHL start, stopped 11 of the 13 shots he he had faced to that point. With 9:00 left in the game, a scrum in the Flyers’ defensive corner was lost by both Brandon Manning and Radko Gudas, and the puck found Damon Severson, who tied the game. The Flyers still looked like they were going to get a tough point on the road against a division opponent, but then No. 1 pick Nico Hischier tipped home the game-winning goal with only 1:27 left. They followed that loss up with a 12-game unbeaten streak (10-0-2), their longest since 2003. Overall, they were 10-1-2 in the month of February, which was their second-best February record in franchise history. They also won seven straight road games in the month, which was their second-longest streak in its team history. The historic month had so many magical moments. Nolan Patrick tied the Feb 3. eventual shootout loss against the Ottawa Senators with 2.9 seconds remaining in the third period. Jordan Weal scored his first career overtime game-winner with 3.1 seconds left to beat the Carolina Hurricanes on Feb. 6. Alex Lyon earned his first NHL win with 25 saves in two periods in relief in a 7-4 victory over the New York Rangers on Feb. 18. Jakub Voracek tied the game with under 1:30 to play in regulation and then scored the game-winning goal in an overtime against Montreal on Feb. 20. The moment of the month came in the last game, a 1-0 shootout victory over the Montreal Canadiens. Sean Couturier scored the only goal in the shootout, his third career shootout goal in 19 attempts. Petr Mrazek, acquired on Feb. 19 from the Detroit Red Wings, made 28 saves for his first shutout with the team. It was just the 15th game in Flyers history to complete regulation and overtime (if applicable) without a goal on either side. 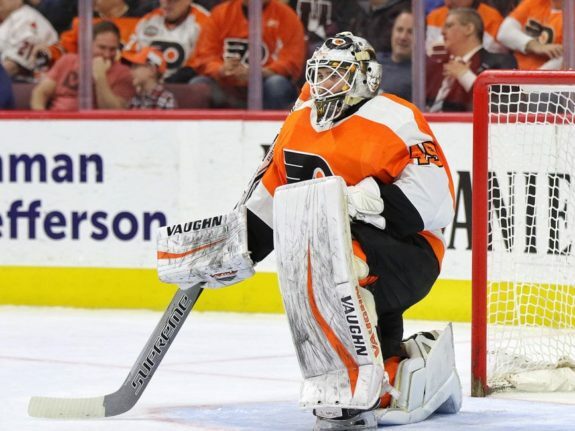 Mrazek moved his record to 3-0 with the Flyers with a 1.30 goals-against average and .947 save percentage, and he seemed to be a genius acquisition by Ron Hextall. The real story was that the Flyers moved into first place in the Metropolitan Division. This was a team, on Jan. 5, that was sitting in last place in the division, with 41 points, 11 points behind the first-place Washington Capitals. They clawed and won their way back into the playoff race, and this run in February was the reason for it. Claude Giroux led the team with eight goals in the 13 February games. He scored his 200th career goal in the 7-4 victory over the Rangers on Feb. 18. Later in the week, he scored a highlight-reel goal in a 5-3 win over Ottawa on Feb. 24. Shayne Gostisbehere tied Giroux with 17 points during the month. He contributed seven of those points on the man-advantage, which also tied Giroux for the team-high of the month. Another reason for the successful month was that the Flyers were only shorthanded 25 times, which was a league-low for the month. They killed off 20 of those shorthanded instances. Michal Neuvirth made some history in a game on Feb. 10 vs the Arizona Coyotes. He stopped the five shooters he faced and became the first NHL goalie in the shootout era to win a game that he entered during the shootout. This was Brian Elliott’s last game until April 5, with him undergoing core muscle surgery, but one dark cloud did not overshadow the Flyers’ most successful month of the season.